I received some fantastic news on Friday and wanted to share. Yesterday I received notice that one of my entries has been accepted for the 2017-18 series! I received the acceptance letter at 5pm on Friday, so I’m not sure which of my works got in or where it will be installed first, but I will add pertinent information as it becomes available. Recently one of my designs was selected for voting in the WBAA 2017 Tee Shirt contest! Per the WBAA page, so head on over and give me a vote! For my entry, I went with a historical approach, I used Neutra Display Titling for the font because it had a 1920s feel, and stuck with a black and white and red color scheme. Voting will run: July 24th – August 10th (deadline 5pm). Voting takes place by email or phone – one vote per person. Winning design will be announced on Friday, August 11th (broadcast and online). RGB.to) is my go to tool when I open clients files, that need colors converted to cmyk. There are many different ways that our digital files store color, different color spaces (like Adobe RGB, sRGB, CMYK, or CIE L*a*b) and even spot colors like Pantone, or RAL. As most customers want a four color CMYK print instead of the costlier spot color print, output I am most often interested in is standard CMYK. This is where RGB.to comes in as a color converting tool. For this example I wanted to use Pantone’s color of the year – Greenery 15-0343. Unfortunately the color of the year is a fabric color so its not in my solid coated swatch-book. I used Pantone’s color conversion tool (Pantone.com/X-ref) to find the solid coated alternative, PMS 2276c. The Pantone color converter is great but it only converts one Pantone color to another pantone color so it isn’t going to be much help if we are going to be printing the files as CMYK. Once we have the coated version of the swatch we can use RGB.to to convert it. With RGB.to converting the color is easy, all you need to do is type the color code (wether it is RGB, CMYK, HSL, HSB or Hex) and the code does the rest. The site, by front end developer Carlos Cabo is pretty well thought out. Once the color is converted all you need to do is click on the label and the values are automatically copied to your clipboard. This site also contains color libraries for HTML, RAL, and Pantone books, although Pantone colors always look different on screen these can give you a ballpark of what they are gonna look like. Hopefully this site is helpful for all you designers out there. I go there every time i need to convert some colors to make my files print ready. Cheers and Happy designing. Wikipedia defines a moustache (UK /məˈstɑːʃ/; American English: mustache, /ˈmʌstæʃ/) is facial hair grown on the upper lip. Moustaches can be groomed by trimming and styling with a type of pomade called moustache wax. A typestache on the other hand, is styled by a typographer. These curly brackets have been selected for display and labeled by designer Tor Weeks. The brackets look remarkably like their namesake, the Typestache. From designer Tor Weeks: Typestaches actually started as a wine and cheese party invitation design. Halfway through designing said invitation, I started playing with brackets as accents pieces. It was when I was attempting to choose the right typeface for the design that I had a whole selection of brackets on the page so from there it just took on a life of its own. All I did was have the good sense to stop forcing it to be an invitation and let it be a poster. 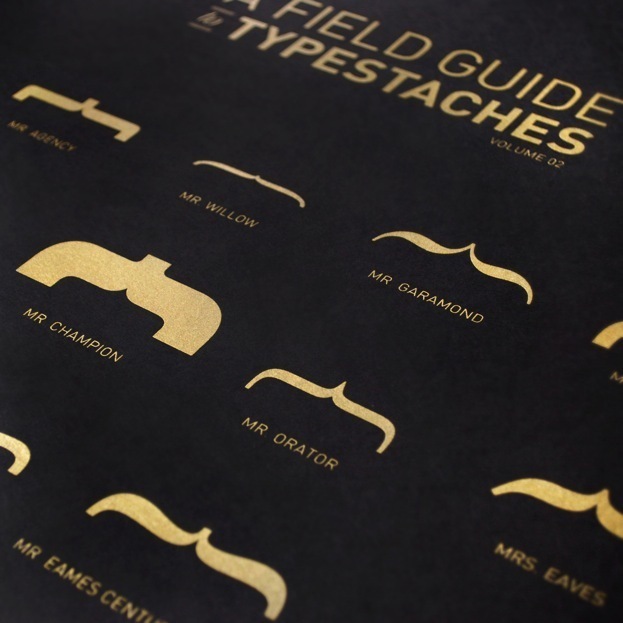 This poster captures the perfect balance of quirkiness, whimsy, and simple clean typography– titled A Field Guide to Typestaches, it shows you how each typeface’s definite brackets can be turned into distinctive moustaches, when you turn them on their sides. 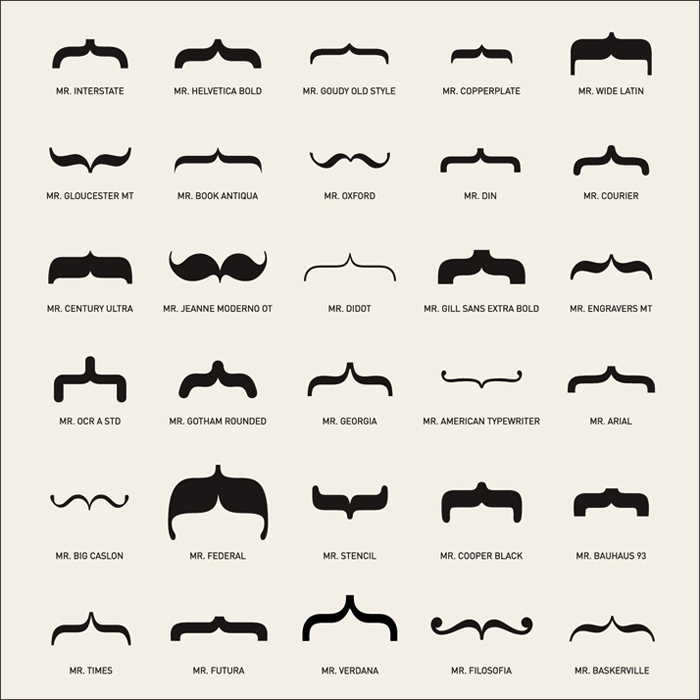 The best part of all this is the little moniker labeling the typestaches, which personifies each type as a gentleman of sorts. While the original poster is no longer available, version 2, in gold on black is available here. The 12 principals of animation are a set of guidelines created by Disney animators Ollie Johnston and Frank Thomas doing the 1930s. This video does a great job of explaining all 12. These are a great starting point for UI and motion designers as well as Illustrators an animators. www.old-picture.com is home to a wonderful collection of historical photographs. Their collection spans the years from 1850 to 1940. These pictures include images from across the globe, and show in detail a unique chronological slice of our shared history. The photos are organized by year, or by a wide variety of subjects. There are photos of everything from Souix Chiefs to steel workers. This week’s installment of Pant-uesdays (Pantone Tuesdays) is PANTONE SMOOTHIES, a delicious mix of color for your tastebuds and food for your eyes. Anyone who has ever put fresh fruit in a blender knows that smoothies can be as vibrant to look at as they are delicious. Hedvig A Kushner, an art director in the big apple, takes that love for the looks of a smoothie a bit further and matches the drink to a pantone. The project so far has over 12 different flavors and they all look delicious. Click on over to Pantone Smoothies and feast your eyes on all the flavors.